Interesting, my last blog post is dated for last Saturday, but it refers to last Friday as “this morning”. Anyway, for MuseCon, last Thursday night we stayed at home, and Friday morning we took the dogs to the vet’s, because many good reasons, then went to the hotel. Robin left for the hotel about the same time Ron and I left the house with the dogs, so that he could go help at Dave’s storage locker and do all his Logistics things. MuseCon was busy. Ops took over hanging all signage, so I sorted signs and left them to it. I was in charge of Stanford/the Workshop Room/Blinkie Room (however you want to think of it). Friday that consisted primarily on making sure that everybody was on the same page for how the room would be set up (blinkies and other soldering things on the south half, everything else on the north half). Most of the Open Builds had moved to the Muse Salon in Marlborough, so Stanford proceeded relatively smoothly, biggest thing was getting hotel engineering to crank up the A/C, because if the room was too warm with <6 people in it for setup on Friday, it was going to be WAY TOO HOT once it got busy. I spent more time in the Salon (vs. Stanford) than I probably should have. I left my knitting at home, other than the turkish braid demo stuff, but I brought some doll clothing materials and tools and worked on kosode. Karen and I discussed ideas for the Salon and Stanford for next year, and have some ideas, considering above re: most Open Builds already having moved to the Salon. Saturday afternoon we reprised the Letterpress Printing Overview, and Saturday night we reprised Dramatic Readings of Music. This time for dramatic readings the chairs were all in a big circle (I think a leftover from a previous session), which was a good arrangement. Sunday morning we did Braided Snake Wristbands (3-strand mystery braid) for/in the kids programming room. I took my Inuk and my classical guitar to MuseCon, and Saturday evening before dramatic readings I took them down to the Salon, where Andrea played them through an amplifier with distortion and feedback. Both sounded good, but the classical guitar played that way just sounded so wroooong to me. Andrea fell in love with the Inuk. Sunday night we went to the hotel restaurant/steakhouse, had sticker shock at the steak prices, and decided to just get soup, salad, and share a twice-baked potato, which was enormous. Then we went to the Necro-Muse music circle, where I flailed away through most of my classical-ish repertoire (mostly shorter bits out of my method book), Ron tried a couple banjo things, and Cathy McManamon made my Inuk sound very nice indeed. We stayed at the hotel Sunday night, and went to breakfast with Ron’s parents on Monday morning. Ron’s sister Alisa had also come to MuseCon, but she left Sunday afternoon. I think they all had a good time. After breakfast we finished packing, hooked up the trailer, and headed home, where we dropped off the trailer, unloaded the truck, and then went out to pick up the dogs. Gimli was a very very tired puppy, he pretty much spent Monday asleep. Ron and I, and I assume Robin, also took naps. Nobody wanted to cook, so both lunch and dinner were invoked. Little Caesar’s called after Ron and the dogs and I had gone to bed, somebody up the food chain had scheduled Robin to open Tuesday morning. And close Wednesday night (at least it wasn’t a clopening). When he’d last checked his schedule, he didn’t have to work until Thursday. He was Not Amused. I can’t say I blame him. Wednesday morning I had a definitely upset tummy, and stayed home, pretty sure combination of sinus/allergy issues and being tired from MuseCon. At one point Robin came downstairs and told me if I was going to nap I should go up and flop in bed. Grumble grumble grumble acting all adult who does this smart-alek kid think he is anyway? Which I did not do, but I did flop on the couch instead of sitting up. And in the afternoon I tried not to nap again. Last night Ron and Robin took blinkie stuff and Mr. Slushie back to D’s. Our stuff is still scattered around the house, and needs to go back to storage. Otter Necessities has an event (Lake Count-I-Con) in two weeks, so a trip to storage will happen some time between now and then to take coolers, etc. back and pick up Otter’s stuff that was stashed for MuseCon. And that pretty much brings us up to today. Except for snake-natter, which will be its own post. Much of the weekend I was working on something like 40 pouches. More natter on that on the Otter blog. But I did get a bit on the current mittens. As is my wont, I work on both mittens, doing a bit on one and then the other, so they leapfrog. This pair has a section of narrow bands on the fingers, and then a section of Komi geometric patterning on the palm and thumb. I’m making them top-down, got the last narrow band done on one mitten, and on Saturday afternoon was going to get the second one to the same point. Except I couldn’t find it. I knew I’d worked on it earlier in the day, but it was gone. It bugged me all evening. I looked, Ron looked, Robin looked, Marmaduke looked. It stayed gone. I started to cast on a replacement, then pulled the cast-on back out. Hunted some more. I looked out in the yard, on suspicion of thieving by Pippin. No mitten. I went to bed annoyed with the missing mitten. It hadn’t re-appeared come morning. We went out to get breakfast. When we got home, I decided to check the back yard again, in daylight (the flashlight function on my iPhone is impressive, but still…). Ron volunteered for that job, and found it. Pippin had stolen it, and since the (little) balls of yarn were tucked inside and the mitten pinned shut with the working needle, there was no tell-tale trail of yarn leading out the dog door, like the other time he stole knitting. In Pippin’s favor, having seems to be the thing, not chewing. So the mitten was undamaged. And I suspects he only steals knitting that’s fallen on the floor, which I think this mitten had done. Knitting left out on a table, the arm of the couch, or even in an open tote bag on the floor seems to be safe. And as soon as Ron walked in the door with it, he knew he was in trouble (not a lot of trouble, but still). Alas, I forgot to wear purple for St. Urho’s Day yesterday. Sob sob. In honor of St. Patrick’s Day, Robin and I are both wearing orange and green. I have a green collared shirt, unbuttoned about halfway down over an orange T-shirt (and a denim skirt and navy leggings). Robin’s wearing an orange shirt, olive drab kilt, and black vest. I know Ron was talking about wearing orange and green yesterday, not sure he remembered this morning. I currently have Flogging Molly playing on my iWhatsit. Going to switch to Gaelic Storm if I have much loaded, or whatever vaguely celtic I have. And I have leftover corned beef and potatoes (not a cabbage fan) from last week for lunch, so I think that’s festive enough. If wearing both orange and green makes you twitch, deal. My mother was Catholic, and a Kennedy (no relation to those Kennedys, AFAIK). Dad is a Scandihoovian Lutheran. Robin is just contrary. So orange and green it is. Catching Up, Over Thataway . . . I have a big catching-up post covering the last week, but its over on the Otter Necessities blog. You really do want to go take a look, it turns out that Robin’s room actually has a floor! There’s photographic proof and everything! And I condensed my yarn stash, but pictures of neatly-stacked bins in a closet really aren’t interesting, so there aren’t any. Here or there. I finished a set of mittens this week, and have started another. The finished mittens are purple with yellow flowers, made from the leftovers from my purple, yellow, and orange Komi mittens. The mittens I’m working on now are yellow (a different one) and blue leftovers from socks I made several years ago, and some more of the leftover purple. The purple and yellow mittens definitely need blocking. I keep looking at these mitten blockers, but I don’t like the cutouts that allow you to use the thumb bits as wraps-per-inch gauges, I’m afraid that they’ll snag floats. And the other thing is that most of the mittens I make have pointy tops. The other choice are these longer gauntlet/wrist warmer blockers, which have smooth thumb pieces, but don’t narrow down for ribbing around the wrist. And don’t have pointy tops. Maybe I’ll e-mail the seller and ask if I can get the mitten blockers with smooth thumb bits. Comments Off on Catching Up, Over Thataway . . . In my previous post, I forgot to mention that I discovered an out-of-print Folkwear pattern that I’m now lusting after: No. 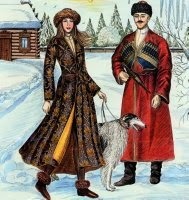 502, Russian Cossack Uniform. We wants it, Precious! Wants it for steampunk outfit(s)! Wants it for Girl Genius Jaeger uniform! Want want want! Unfortunately, it is not only out of print, but very unavailably so. Of course, I discovered it just a couple weeks *after* one sold on eBay.ca for a not-unreasonable price (CAN$25). I’ve got an eBay search set up for it, hopefully I’ll be able to find one sooner or later. I’ve been working on the floodplain managers’ conference program book, so sewing has been at a standstill. However, I’ve been poking around learning how Victorian-era vests were made and what with. And then deciding what I was and wasn’t going to do along those lines, because steampunk isn’t exactly historically accurate. Today I ordered patterns and fabric. I went ahead and got the Folkwear vest and Victorian shirt patterns. I don’t recall the authenticity-minded opinion on the shirt, but the vest pattern gets a thumbs-up. I ordered from Vogue, so there’s a chance I could have the patterns as early as tomorrow. For the vests I got two black brocades, one with a grey fern-leaf pattern, and one with a brown floral. I also got floral (rose) brocades in green and amber. I got enough amber for two vests. Lining was typically muslin, so I’m good there. For the backs I got black, dark grey, and brown cotton sateen – vests usually had brown “holland” (polished linen) backs, but black and dark grey aren’t out of the question, and sateen is the usual modern alternate to holland. So, I have enough fabric for 5 vests. Good thing I’ve develop an urge to make vests. The two black brocades are actually stretchy, with 2-3% lycra content, but vests were typically interfaced, so a layer of muslin should both act and interfacing and un-stretchy the brocades. 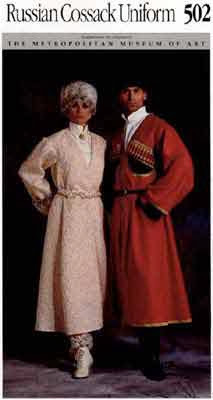 Didn’t order OD twill for Russian-ish uniform tunics, the vest bug jumped the queue. From fabrics.com I got cotton broadcloth ($3-ish/yard) in black, grey, and tan, for shirts. Or whatever. Dressy shirts were actually white most of the time, but given our hard water, I decided that I’d be making not-white dress shirts, thanksverymuch. First step on the vests will be tracing the pattern onto the non-woven interfacing-ish material I have, then cutting out the basic shell in muslin to see what alterations may need to be made for Ron and Robin. After, however, I hem my long vest. Ron has promised to mark/pin the hems for me this weekend, unless I’m busy with the program book and/or leatherworking.